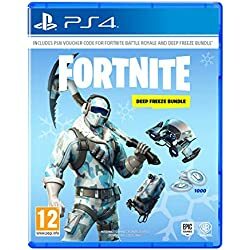 Unless you’ve been living on another planet for the past year, at some point you would have heard about the action packed global sensation FORTNITE developed by Epic Games. 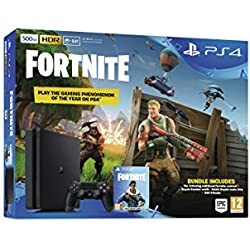 Fortnite is THE online video game developed by Epic Games first released in 2017. 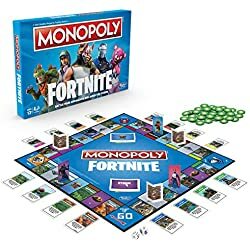 This online multiplayer battle royale (last-person-standing) game for up to 100 players has taken the world by storm with an incredible fan base of all ages to boot. Players take the game very seriously and it may be hard to find the perfect gift if you have no idea what it’s all about. 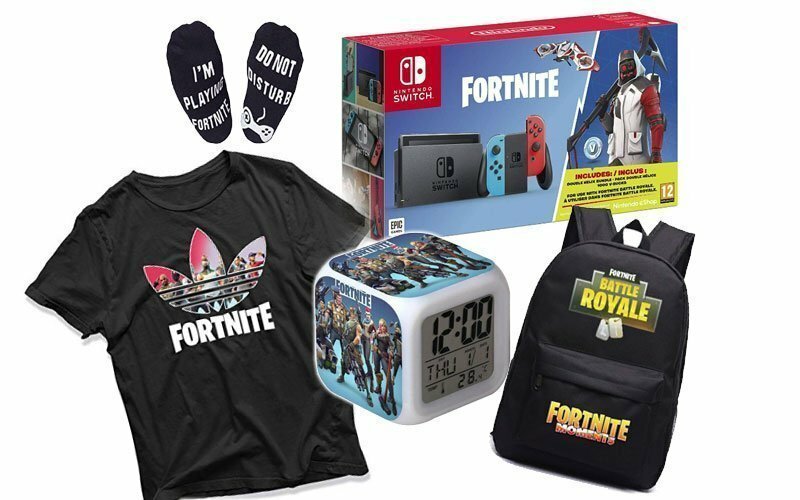 So show the Fortnite fanatic in your life how much you care, or treat yourself to some cool merch with our roundup of great gifts and accessories. Seriously, this one is going to be BIG! – Nintendo have the perfect combination here. 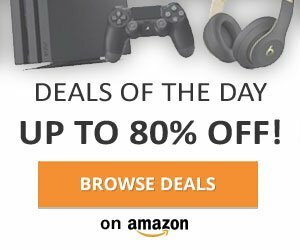 By combining possibly the most awesome, fastest selling console ever the Nintendo Switch, with the most popular game at the moment this bundle is sure to be a winner. What makes it even better is being able to play FORTNITE anytime and anywhere whilst on the go. 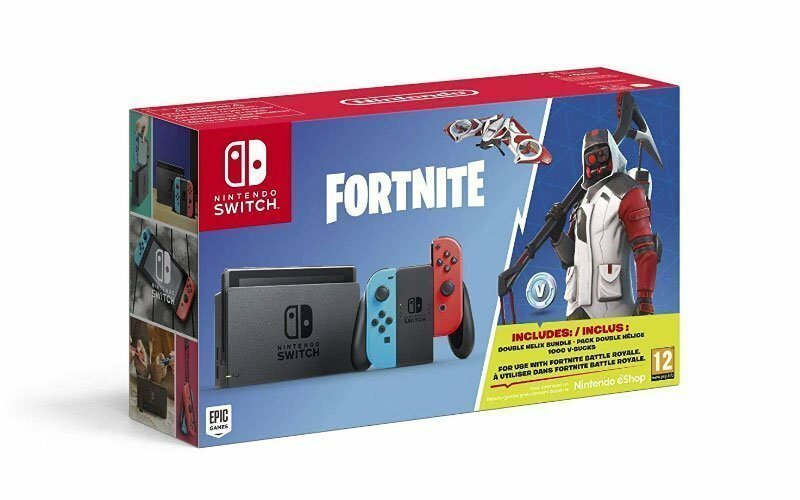 This amazing pack also includes 1,000 V-Bucks (in-game Fortnite currency) and the Double Helix Bundle – consisting of a unique Character Outfit, Back Bling, Glider and Pickaxe to get you started. Available in various colours and sizes this Battle Royale Leaf Print Logo T-Shirt will make the perfect gift for the Fortnite fanatic in you. Made from a premium blend of 90% Cotton and 10% Polyester you’ll be able to rep your favourite game in style and comfort. This cool digital alarm clock features a seven colour changing night light which cycles through as you touch it. 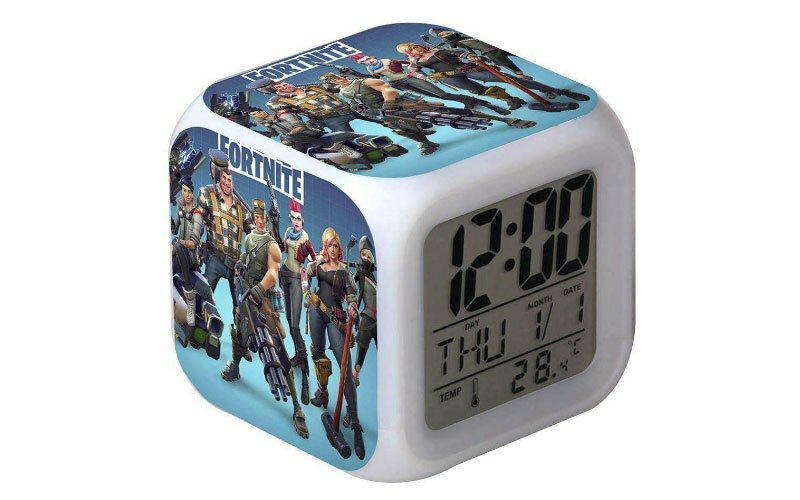 With a snooze feature and 8 different alarm sounds, you’ll surely be able to rise in the morning after a hectic night of fortnite. It’s clear LCD screen displays the time, date, day of the week and temperature in Fahrenheit or Celsius and can be powered by batteries or a USB cable (Not Included). This durable Battle Royale Backpack has a double zipper on the main compartment for extra security and has plenty of room inside for all of your belongings. It features a front zip pocket and two side mesh pockets , with textured adjustment buckles on the handles to ensure a perfect fit. 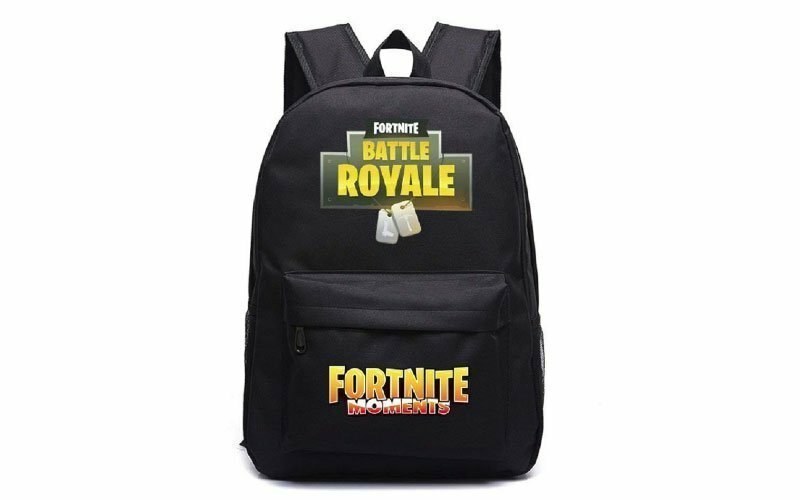 Available in various colours all emblazoned with the iconic Fortnite and Battle Royale logos. 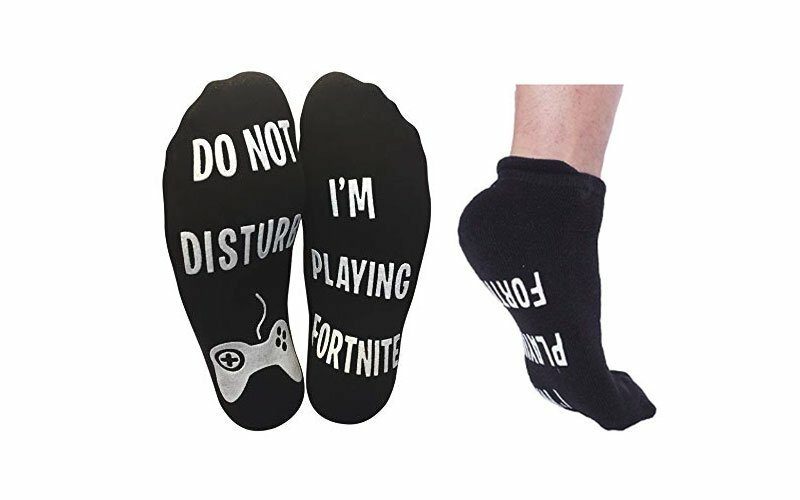 Most of us wear socks, and what better way to chill and play than with these cosy Fortnite ankle socks. Made of a cotton and polyester blend the’re totally breathable so say goodbye to sweaty feet, plus you get 3 pairs in the pack to swap and change. The white phrasing on each foot is both fun and full of attitude, plus it’s non slip so you’re sure to not lose grip when your running back to your game in excitement. One size fits all both adults and children. What better way to let your loved ones get the message while you put your feet up!